From the Roman’s discovery of fermented apples during their first rendezvous to England in 55 BC, to the cider making tools brought over on the Mayflower, it’s no denying that hard cider has history. Requiring nothing but apples and time, stateside hard cider was the drink of the American farmer, soon to be overshadowed by barley, rye and corn during the Industrial Revolution, and eventually all but eliminated during Prohibition. Cider did manage to stick around though, making it’s way to our shelves in the form of the super sweet, gluten-free alternative to beer that we are all too familiar. The last decade, however, has seen a revival of cider consumption and production across the United States - with cider bars and cideries popping up across the country. Americans have been re-introduced to cider, and we cannot get enough. It’s no surprise that the big guys have caught on as well, with the majority of cider in the US coming from the likes of large brands owned by big beverage companies. Despite big name labels filling up the shelves, small production cider makers continue to grow and prove just how complex and terroir-driven cider can be. One of these producers is Bryan Ulbrich - winemaker, cider maker, and owner of Michigan’s own Left Foot Charley. 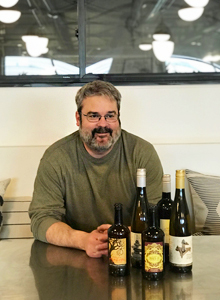 The state’s first “urban winery,” Bryan owns no palatial estate - instead he sources fruit from small, exceptional vineyards in Northern Michigan. But while Bryan’s wines are leading the way to define terroir in Northern Michigan, his orchard focused, low-intervention cider philosophy is a revival of Michigan’s rich history in cider making. We caught up with Bryan at Cream to talk all things cider and learned quite a lot about the past, present and future of Michigan cider. How did you get into cider making, and how long have you been making cider? I started making apple wine (basically higher alcohol cider) but got into the classic hard cider production in 2008. Left Foot Charley’s wine is sourced from the vineyards of some of Northern Michigan’s most significant growers. What kind of apples do you use, and where do you get them from? We work directly with four local farms and one farm in the Lansing area that helps us source fruit from there and the Grand Rapids area. The apples trees that we source from are on average about 20 years old. It takes close to 7 years for a tree to start producing good fruit. For regular apple consumption, most apple trees are ripped and replaced every 30 years. We instead look towards Europe, where some cider producers are sourcing fruit from trees that are between 100 and 150 years old like Eric Bordelet. I’m hoping to someday source fruit from healthy trees that are over 30 years, and help the MI cider industry better understand how the age of a tree can impact cider characteristics. Varieties we use include Jonathan, Ida Red, Empire, Spy, Macs, Greening, Golden Russet, Porter’s Perfection, Ashmead’s Kernel, Wickson, Red Harrelson, Brown Snout, Baldwin, Yarlington Mill, Dabinett, Benet Rouge, Esopous Spitzenberg, Winter Banana, Winesaps, Cortland, Harry Master’s Jersey, Chisel Jersey, Arkansas Black, Otterson* (pictured cut open on the right) and others I am unintentionally forgetting right now. *The Northman Chicago is getting two kegs of LFC’s Otterson Cider. What characterizes a good apple for making cider? I like acid. We are finding that the bittersharps that grow well up here provide good supporting tannins and higher sugars as well. In the end I believe it comes down to a blend. There are so many possibilities with tweaking the balance. It’s like playing with an equalizer on an old school stereo. Over all the fruit must be ripe regardless of the variety. We want to avoid unripe acid and starchiness. People planting new orchards are now considering which varieties would be best for making cider as they section off these areas from commercial plots. 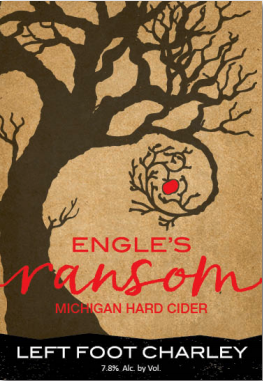 For example, our Engle’s Ransom cider is sourced from an orchard in Grand Traverse County. Farmer Ken Engle has planted 35 different varieties to experiment in years to come with which apples work best for cider making. Does winemaking influence your cider making? If yes, how? Yes very much. We approach apples with the same reverence that we do grapes. Each variety, terroir, and vintage has an impact on the possible flavor outcome. It is our job to discover and release this potential. While it is currently illegal to print the year on hard cider, ours are vintage driven just like wine (look out for batch 2019!). The techniques we use are very similar to our Pinot Blanc and Riesling fermentation and aging protocols. Like our wines, our ciders are fermented with a combination of “volunteer vineyard yeast” (aka native yeast) and selected yeast, and we halt the fermentation to preserve the natural sweetness whenever possible. While a recent trend in cider has been the addition of different flavor profiles like Cinnamon Girl, our orchard-driven ciders tend towards a cleaner, more aromatic profile. Recently, we have also been experimenting with barrel aging our ciders. You produce many different ciders. What is your inspiration behind each cider? Do you look to other cider producers and/or regions when thinking of new ciders to make? Please elaborate on some of your ciders and specific production techniques…like how yeast strains can change a cider. This is a thesis topic. We are finding that each farm reflects a specific terroir through their varieties, growing methods, soil, and ripening conditions - just like grapes. Our Antrim County Cider for example is a farm specific blend grown by the Boals family on old standard trees with 50% Greening and 50% Jonathan. We find this blend gives us an excellent example of a very clean and fruit-forward cider with natural sweetness to balance the striking acids. It is a purely modern approach that does not allow for too much in terms of instability or microbial volunteerism. I want this cider to be all about fruit cleanliness and expression. On the other side we have an orchard 10 miles down the road that grows classic French and British varieties. Here we are looking for a more rustic approach that allows for more contribution from all of the flora that surrounds the orchard and lives in the winery. This cider relies on the tannins, alcohol, and acid as the preservation and expression. This cider, Engle’s Ransom, is fully dry and unfiltered. 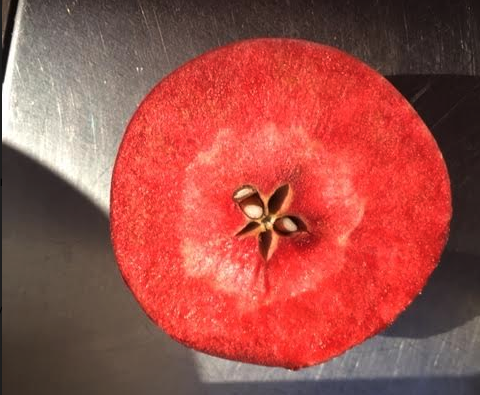 We want this one to be about mouthfeel, texture, and a sense of wildness from the orchard. We also play around with barrel aging and different blends from around the state. How does cider production in the United States fit in on a global scale? I am trying to figure this out. I know there is intense interest in regional US ciders (Washington, Michigan, Vermont/East Coast, Virginia). There is certainly a national trend toward flavored ciders (berry, hop, cinnamon, ginger etc..). Straight up apple cider is more rare actually. I think this is part of the youthful playfulness the US industry enjoys as well as consumer experimentation with a relatively new drink. World ciders are just beginning to break down centuries’ old traditions to experiment with odd combinations. But they largely focus on the fruit itself not adjunct recipes. I like this way of thinking personally. Do you think consumption is trending up? Any thoughts on the future of cider in MI, the USA, etc? Consumption is trending up. 2005 was around the time that we saw a rebirth in Michigan cider. I think it has only grown since then. I am not sure how widespread Left Foot Charley’s ciders will get as we make ours in very small quantities relative to many distribution models. It seems that the regional model continues to grow even as the macro cider level experiences varying degrees of saturation, decline, rediscovery, and rebound. They seem to ebb and flow more frequently. The premium tier appears to be on a more consistent trajectory. There are a few big players in Michigan that are able to hold on to quality juice sources and still be economically competitive in the Midwest and beyond. Scale seems to put a lot of pressure on shelf price which ultimately filters down to apple sourcing. As an industry, Michigan is still able to work with premium fruit and hold interest at many price points and style. We have quite an advantage with a vibrant and historic apple producing industry in our state. Hard cider emerged just when apple prices were falling and farmers were questioning the future. Hard cider has re-ignited interest in maintaining the old farms as well as planting new acreage. There is a significant body of apple growing knowledge in our state that keeps us in the forefront of supply and innovation. The key though is to keep prices where it makes sense to farm and continue investment in the land. If we get too big too fast and try to dance at all the dances, cider prices will start to decline and we will just be repeating old mistakes. It is expensive to farm. Cider producers need to create ciders that respect and honor the farms as more than just a commodity. Cider producers also need to develop relationships with consumers so they can have confidence that a particular cider is not part of the race to the bottom, but a true reflection of the farm. What do you like to eat with cider? I’m not very discriminating here. Cider is extremely versatile. I am an old school charcoal grill man and nothing passes those flames that won’t pair well with a hard cider. Pizza too. Classic pork chops and applesauce is a lay up, but I also really like sweeter ciders with fiery hot Thai food and Mexican inspired spices. We do a lot of cheese pairing with cider which is just as exciting as any wine pairing. What’s something about Michigan wine and cider making that outsiders may not know? We are using real apples grown from centuries old traditions. Apples are not a trendy fad in Michigan; they are a historic part of our economy and lifestyle. They grow throughout the state which makes Michigan cider accessible to a cool diverse demographic from Detroit to the Upper Peninsula. Each region/state produces cider that tastes different; Michigan can grow high acid apples, where as those varieties don’t grow as well in warmer climates like Virginia. You are never very far from a lake or a hard cider producer in Michigan. And guess what? Hard Cider is perfect for a day on the boat or at the beach too! Do you have any tips for a DIY cider maker? Find a local grower or juicer and use unpasteurized, fresh juice. Keep your practices clean, and the cider will guide you.